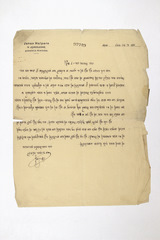 Description: A letter from Janas Halpern wishing writer Isaac Leib Peretz a happy 60th birthday, Jedrzejow, 1911. Halpern especially praises Peretz for being a trailblazer in the literary depiction of Hasidic life. He hopes that he will once again have the opportunity to present his own work to Peretz for critique.